Office1 is happy to announce that it has been recognized as a Ricoh Eco Excellence Member for the second consecutive year. 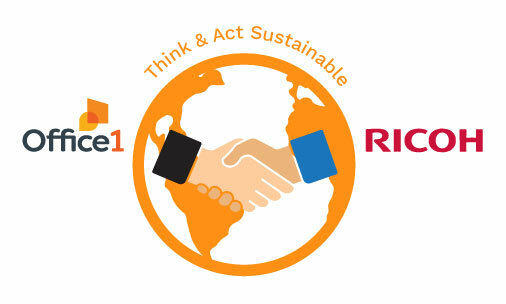 Ricoh’s Eco Excellence Membership recognizes Office1’s commitment to practicing environmental sustainability. Membership is awarded only to dealers that meet key criteria — including a proven track record of environmental sustainability and the ability to provide customers with education, awareness, program guidance and support. Ricoh, a strong supporter of ENERGY STAR®, strives for practical energy performance while maintaining ease of use. As a charter member of the EPEAT® (Electronic Product Environmental Assessment Tool) program — an environmental procurement standard for imaging equipment, Ricoh is helping customers identify greener products based on energy efficiency, materials selection, indoor air quality and take-back programs. 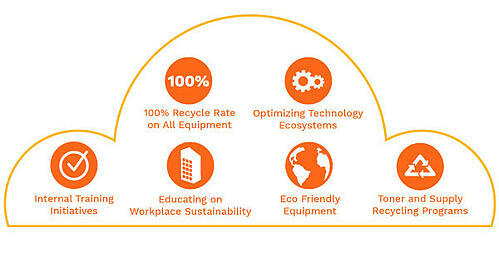 Achieving and maintaining a 100% recycle rate on all equipment. Optimizing technology ecosystems to minimize carbon foot prints, maximize productivity, and bolster your company’s bottom line. Innovative materials educating on workplace sustainability. Toner and supply recycling programs. Office1 CEO Todd Rogers says Office1 is committed to help you reach eco-excellence. With Office1, set a new standard through technology and make sustainability the norm. Office1 has the people, the processes and technologies to optimize your operations and increase your bottom line all while going green.